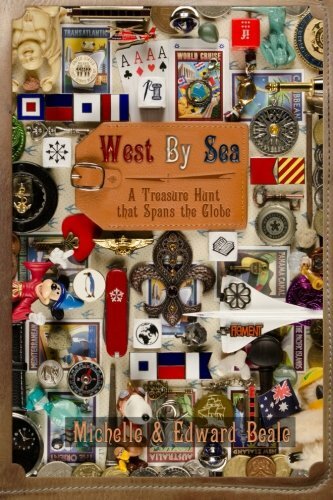 My first impression of “West By Sea: A Treasure Hunt that Spans the Globe” by Michelle & Edward Beale was one of curiosity and wonder. The cover reminded me of a treasure box I used to have where I collected matchboxes from around the world, given to me by my Uncle who used to travel everywhere. When I opened the book, I realized that the book itself is a treasure box! As I began reading, I quickly felt Michelle and her husband’s excitement and anticipation. After Michelle was diagnosed with brain cancer, they decided to take the trip of their dreams. I was grateful they decided to focus the beginning of their book on the happiness of living their dream and not the sadness of what motivated them to do so. It was their ability to be positive and excited that captured me from the beginning, as I believe that it is there where the inspirational message stands. Michelle & Edward Beale did an impeccable job creating this book. Their well-written story is presented as a travel log/journal, which is at the same time a treasure hunt map filled with clues for the reader to figure out. The formatting and book design gives a feeling of adventure to the reader making it even more fun and colorful. It still amazes me how they were able to radiate so much happiness during this difficult time as they dealt with Michelle’s cancer diagnosis. Being a sufferer of few chronic illnesses myself, I found their journey truly inspiring…so much so, that I have actually booked an escapade with my husband to follow in their footsteps! Overall, “West By Sea: A Treasure Hunt that Spans the Globe” by Michelle & Edward Beale is an inspiring, fun, and colorful read; one that will be enjoyed as a five star memoir by all readers, as well as a source of inspiration for those who are dealing with dark moments in their lives. It is also a comeback of an awesome way of playing treasure hunting in an age of digital instant gratification. I hope to see more from this author duo!